Some of you may know that I’ve been recently doing a lot of development using Node.js. One of my first creations that I’m really proud of (and one that is out there in the wild being used by my employer, Adobe) is the EventQs service. Of course when building EventQs I used several third-party packages (Node.js libs) starting with the Express framework and including libs like Moment.js for date manipulation. All of these are available through the npmjs.org registry, which is an essential element of Node development. One of the things I missed with the npmjs.org was some way to get notified when packages that I use are updated. I wanted to receive notifications without having to remember to periodically run commands like npm update or use the very helpful npm-police tool. While building scroll2play I experimented with a few really fresh features of modern web browsers. The first are viewport relative units of measure vw & vh which allowed me to scale loaded image widths and heights to the size of the viewport. The second is the window.URL.createObjectURL function which creates a URL that is a reference to locally cached blob. In my case blobs were images loaded using XMLHttpRequest. I encourage you to learn more about these new cool features. The future of responsive layouts is here! As you may know, recently I’ve been dealing with Chrome Extensions and their APIs quite a bit. 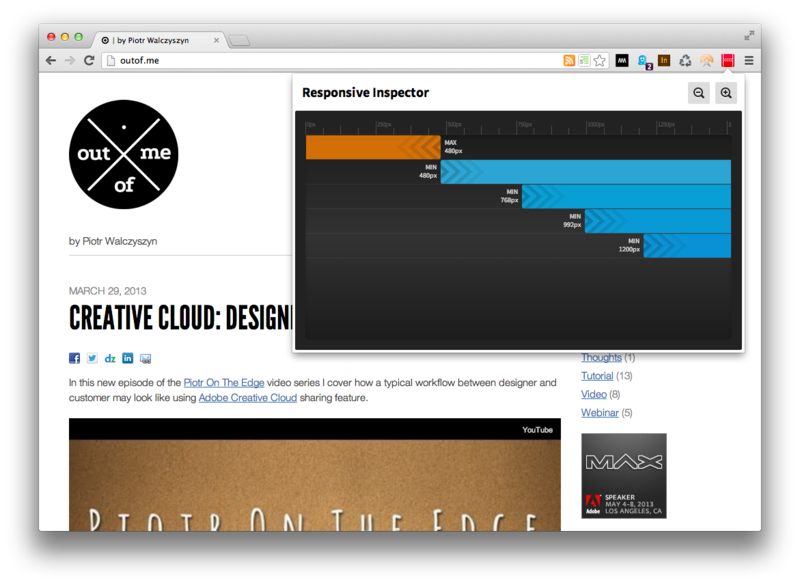 This is because I’ve been working on my Responsive Inspector tool. (If you haven’t seen it yet and you are into Responsive Web Designs I recommend you check it out!) Overall I had a great experience with the Chrome Extensions API, except for just one function that really gave me a hard time. This function is captureVisibleTab, which is a key to whole page screen shots feature that I implemented in Responsive Inspector. The issue I experienced with it was that on some sites the captured screen shots had double the normal resolution. This was only happening on my MacBook with Retina display, and not on every site. On the sites that had this issue, I started isolating the problem element by element and I discovered that the root cause was a translate3d transformation. To work around this problem I included a div element with transform: translate3d(0,0,0) in a page that embeds in an iframe the captured site so that every screen shot had doubled resolution no matter if it used translate3d or not. In this new episode of the Piotr On The Edge video series I demonstrate how you can integrate HTML5 animations built using Adobe Edge Animate with DPS-based (Digital Publishing Suite) magazines.